For decades Egypt has found itself at the centre of protracted battles between successive US administrations and their domestic opponents over the principles and priorities of US foreign policy. Today, as always happens when Egypt’s head-of-state visits the US, attempts are being made to undermine Egyptian-US relations. President Abdel-Fattah Al-Sisi’s visit to New York to attend the opening of this year’s UN General Assembly session, during which he met with President Donald Trump, has been accompanied by a flood of unsubstantiated allegations. The anti-Egypt campaign in some US newspapers is even more vicious than its predecessors, lent impetus by Trump’s release of US aid to Egypt which had been blocked since 2016. Next year the two countries will celebrate the 45th anniversary of relations that were restored in 1974, following a seven-year hiatus after the 1967 War. And it is clear much cooperation will be needed in the future, as attempts grow to forge a peace between the Palestinians and Israel, to battle terrorism and halt Iranian expansion into the Arab region. Egypt remains instrumental in the process of restoring calm between Israel and Palestinian resistance movements. Israeli Prime Minister Benjamin Netanyahu recognised how crucial the Egyptian role was during more than a month of confrontations between Hamas and Israel in the summer of 2014 when he admitted that Turkish and Qatari mediation efforts had failed. At the time, and despite president Barack Obama’s unfriendly attitude towards Egypt after the Egyptian people and army overthrew Muslim Brotherhood rule, it was Egyptian efforts that succeeded in bringing an end to confrontations the US feared might jeopardise international peace and security if allowed to continue. Today, Egypt remains a fundamental partner in the drive to unify Palestinian ranks and to reconcile Hamas with the Palestinian Authority in Ramallah so as to prepare the ground for American efforts to promote a lasting solution to the Palestinian/Arab-Israeli conflict. Egypt’s contributions to the fight against terrorism go beyond cooperation with the US and the exchange of intelligence. Egypt has assumed the lion’s share of hunting down and eliminating the groups which have proliferated along its borders and jeopardise not just Egyptian security but America’s vital interests across the Middle East. Iran’s expansion could also undermine many US interests as Tehran continues to target countries that are friends to both Egypt and the US. Without cooperation between Egypt and the US on this issue Iran could pose a serious threat to the Gulf and maritime trade routes in the Red Sea. The strength of the US-Egyptian bilateral relationship is anchored in the fact that there is no alternative to Washington’s role in bringing peace and security to the region. US support, in the form of grants, assistance and investment, is also vital to the recovery and development of Egypt’s economy. The bilateral relationship will remain indispensable for the foreseeable future given the extent of the two countries’ overlapping interests. In his State of the Union address on 30 January Trump said US foreign assistance should “always serve American interests and only go to America’s friends”. The principle which has guided US foreign policy since Trump came to power first emerged under president Ronald Reagan (1980-1988). Trump’s opponents, however, complain loudly that what it means is that assistance sometimes goes to governments that follow policies and practices inimical to the principles of human rights which Washington regards as an integral part of American values. It has been alleged that under President Al-Sisi Egypt has seen a rise in grave human rights violations and the number of detainees in Egyptian prisons now exceeds more than 60,000. Yet however many times these allegations are repeated, no evidence is provided to back them up. There are no detailed statistics provided, no names of the alleged detainees or information about the place and date of their detention. The organisations making these allegations earlier released reports complaining about the extent of forced disappearances in Egypt. It subsequently came to light that the numbers they cited involved people who had fled the country to fight in the ranks of the Islamic State in Syria, Iraq and Libya. Another common allegation against Egypt is that restrictions on the press and journalists have stifled opposition voices and dozens of journalists have been arrested and face detention without trial or else are prosecuted in sham trials. It is also claimed the Egyptian authorities arbitrarily shut down bloggers’ websites and have arrested bloggers on the pretext they pose a threat to national security. Yet it is impossible to prove that the journalists who left their jobs at newspapers or television stations were forced to do so as a consequence of criticisms they had made against the regime. Parts of the media are public, other parts are controlled by special interest groups. The views of some journalists may clash with the views held by their publishers, be they state-owned or private, and as a consequence they may have left their jobs. But it remains difficult to identify with certainty who was behind a decision to ban or block a journalist. As for social media and blogging, it is a field that all governments find hard to monitor and restrict. In the case of Egypt, where more than 40 million people have Internet accounts, less than 500 sites were closed due to content that spread rumours or incitement against the members of the Armed Forces and police or that communicated with and promoted the policies of hostile entities abroad. All such actions are crimes punishable under law in the conventional media as well. Critics have also claimed the government has passed laws that hamper the ability of NGOs and civil society organisations to operate freely. What they fail to note is that these laws were passed under exceptional circumstances. Their purpose is to control how and why some organisations are funded and ensure that the organisations’ financial capacities are not used as a cover for illegitimate and terrorist activities. The laws, in any case, can be changed when conditions return to normal. Preventing the “politicisation” of an NGO does not infringe on the natural rights of individuals and groups. The financial gains to be had in NGOs have lured many political activists away from political parties, which are the legitimate place for the exercise of political activity. The activists then politicise a realm that is supposed to be dedicated to apolitical activities, harming both the NGOs’ sphere of activity and the realm of politics. Egypt has also been accused of misusing military aid. It is claimed that Egypt’s security forces use some of the weapons obtained from the US to kill political opponents. Some even argue that the weapons Egypt obtains from the US in the framework of the military aid programme are redundant given the peace agreement between Egypt and Israel. The claim that the Egyptian army no longer needs advanced or diversified weaponry now that there is peace with Israel is clearly provocative. Israel continues to arm itself with the most advanced US-made weapons which are mostly paid for through US military aid to Israel despite the fact that Egypt has a peace agreement with Israel and two of the largest Arab armies that once posed a threat to Israel — Syrian and Iraqi — no longer feature in the equation. Egypt, which is contending with the threat posed by terrorist groups, is adjacent to countries — Sudan and Libya — that are not in full control of their borders. It also neighbours an area that is under the control of the military wing of the Muslim Brotherhood — Hamas in Gaza, which has regional backers including Qatar and Turkey. Those who object to US support for Egypt say Washington made Egypt an aid recipient as a reward for having signed a peace agreement with Israel in 1979 but that the strategic environment has now changed and the rationale for aid no longer applies. Peace with Israel, they insist, serves Egyptian interests above all. It is clearly unacceptable to maintain that the peace agreement was solely in Egypt’s interests. It was in the interests of all parties — Egypt, Israel and the US. Egypt, moreover, had to pay a heavy price for concluding the agreement. In the decade after the accord was signed it lost Arab aid and investments worth more than the total value of US aid from the date it began to the present. At a time when Egypt’s vital interests in the Arab region were in peril the US reaped the fruits of the peace between Egypt and Israel in the form of reduced Soviet influence in the region. The huge defence burden that the US and Israel shouldered began to ease after the Camp David Accord while Egypt, once relations with the Arabs resumed at the end of the 1980s, played a leading role in the drive to promote peace between Israel and the Palestinians. When terrorism reared its head against Egyptian, US and global interests Egypt became, and remained, a cornerstone in the coalition to fight terrorism. The principles that underlie Egyptian policy have not changed, even at times when Washington froze part of its assistance to Egypt. 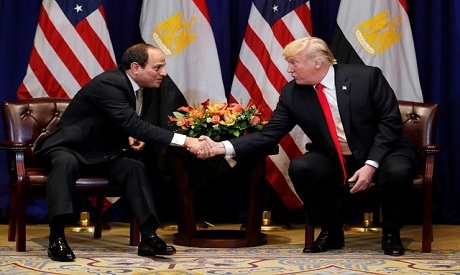 To promote shared Egyptian-US interests officials in Washington, in Congress and the State Department, need to ensure that the NGOs and government agencies issuing reports on the human rights situation in Egypt provide proof of their allegations. For government bodies to continue to base policy decisions on Egypt on reports that lack factual corroboration will only arouse suspicions concerning their intents and aims.